Successfully Added Preorder HK Warehouse Blackview R6 Android Phone - Android 6.0, Dual-SIM, 5.5 Inch Display, 4G, Quad-Core CPU, 3GB RAM (White) to your Shopping Cart. This Product is a Pre-Order Product that is expected to be shipped on the 21st of November 2016. Do not order with other products. This is a Pre-Order product and as such the weight, dimensions and specifications of this product could be subject to change. We will update the listing when the product is received in stock. 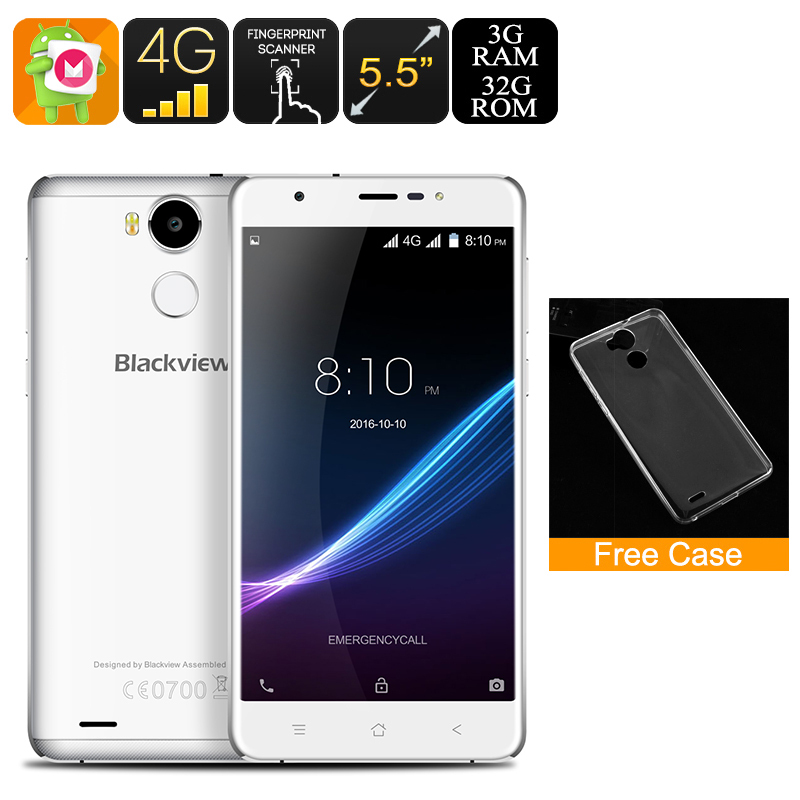 The Blackview R6 is one of those rare examples of a high-end smartphone that holds all the latest features and great specs, yet comes at a remarkably low price. With its slim and stylish body, this smartphone truly holds the look of a flagship model. Not only stunning from the outside, this Android phone also packs some serious hardware that allows you to smoothly enjoy the latest media and Applications. Running on an Android 6.0 operating system the Blackview R6 comes with all the familiar features Android users are used too, guaranteeing a smooth and lag-free user experience. Packing a Quad-Core CPU that has been clocked at 1.5GHz this Chinese smartphone will get you through the most demanding of sessions without slowing down your device. 3GB of RAM is there to support excessive multi-tasking sessions, making the Blackview R6 a perfect smartphone that can be used for business and entertainment alike. Additionally, its Mali-T720 graphics unit provides you with breathtaking visuals and vivid colors, allowing you to enjoy all your media, games, and more in absolute stunning beauty on the phone’s 5.5 Inch Full HD 1080p display. With its large and beautiful 5.5 Inch display, this phablet offers a limitless visual experience for you to enjoy all your phone’s features to their absolute most. 32GB of internal storage and an additional 64GB of external memory ensure that there will always be enough space for you to save your media, files, games, and more. From now on you’ll be able to carry around days worth of mobile entertainment within your pocket no matter where you’re headed. Packing a 2900mAh battery the Blackview R6 gives you the juice needed to get through the most demanding and mobile entertainment filled days without needing to worry about battery life. At the back of this device an ultra-fast fingerprint scanner can be found that helps you to secure all your personal files. No longer will there be the need to remember unlocking patterns or to type long passwords to access your files – with this fingerprint scanner you’ll be able to unlock your smartphone with the simple touch of a finger. Supporting 4G connectivity the Blackview R6 provides you with the fastest mobile data speeds out there, letting you browse the web and download files in the blink of an eye. Additionally, this Android phone features two IMEI numbers, letting you connect to two different network providers simultaneously. The possibility to be reachable on two phone numbers while using just one device makes this Chinese phone the perfect platform on which to efficiently separate your professional and private life. The Blackview R6 comes with a 12 months warranty, brought to you by the leader in Android pones as well as wholesale electronic gadgets.. Overall, it has nice specs. I love that it runs Android 6.0 and it has a reasonably large RAM. It's only quadcore, it must be nicer if it's octacore and if it has higher camera megapixels. It looks amazing and makes nice photos.I recommend it. Awsome phone...beautiful and very capable. big screen...3gb ram..Dual sim.. super valuable. Wow... This phone is packed with power in a 5.5 inch device. I'm loving it so much.